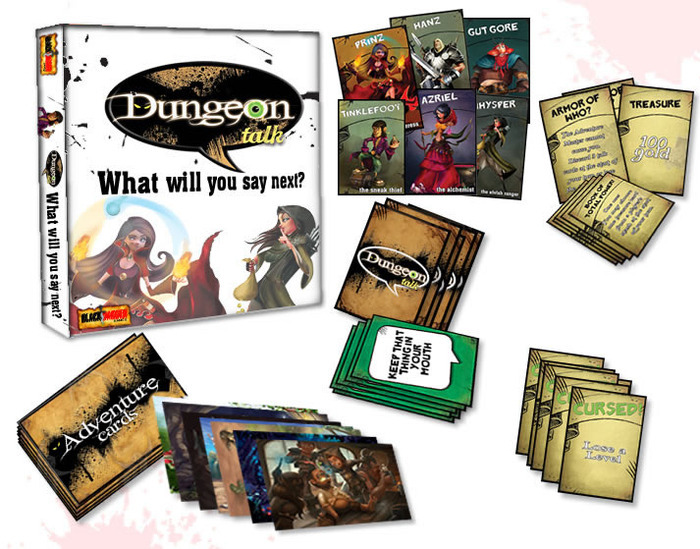 Black Dagger Games is running a Kickstarter campaign for Dungeon Talk: What Will You Say Next?, their new adventure board game with a party card game twist. Dungeon Talk (DT) is 2-6 player humorous fantasy-themed imaginative card driven game best described as a hilarious mix of Dixit, Apples to Apples, Munchkin, and with a sprinkle of creative story telling. DT comes with both the basic (for a quick party game) and advanced versions (for a fantasy adventure). Players reveal fantasy art pictures/scenes in which they'll secretly play creative sayings to best describe what they see. One player picks the saying they like best. DT comes with over 280 game cards with12,000 variations for endless re-playability. DT can be learned in 5 minutes and played in under 30 minutes. Gamers and families (including young kids) will enjoy DT's story and humor-driven fantasy game play - it also makes the perfect gift!